Amongst all the knitted Christmas gifts (and, by the way, thank you all for your encouragement! ), I've also squeezed in a couple of little cooler weather treats for myself this fall. Mods: Yarn was thinner than called for, so I cast on more stitches. I was sick-as-a-dog at the time, so unfortunately didn't record anything. Actually, I'm shocked this came out, now that I think about it, because I really have no idea what I did to mod the pattern. I was first introduced to this great pattern by Canary Knits, who has made several of them and who also did a profile on the designer last year. 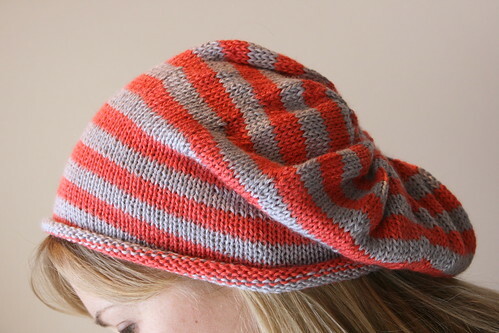 This pattern is fantastic -- Nettie seems to have gotten the proportion and slouch of this hat just right and it's fun browsing the 1662 Felicities on Ravelry to see the various yarns and color combinations people have used. They all look fantastic. Now the question is whether or not I can actually pull off wearing an orange and purple slouchy knit cap. We shall see. I made something similar last year for a gift and it was one of those that I kind of wanted to keep. Strangely enough, I used the same exact yarn and cast on the same number of stitches with the same size needles, and this year's scarf turned out a few feet longer. Maybe I'm knitting looser these days, who knows. My favorite thing about this scarf is how the wrong side looks; the stripes aren't quite so apparent and the colors almost start to blend into each other. Plus, it's very, very warm! Happy Thanksgiving, all (who happen to be in or from the US)! If, like me, you "get" to travel on this, the busiest travel day of the year, be safe! And let's all collectively cross our fingers for zero flight delays and minimal traffic jams. they are both awesome!! 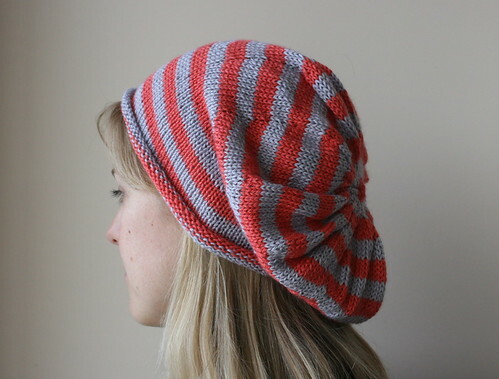 that does look like the perfectly proportioned slouchy hat. 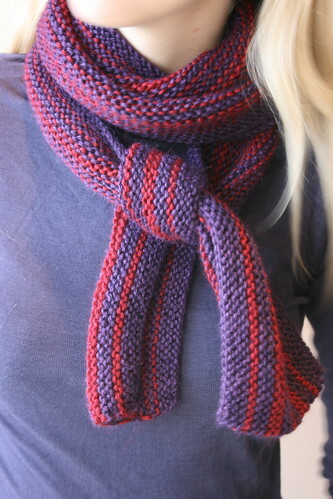 And garter row scarves knit lengthwise... I love them. One day I will knit one! Btw, you can totally do the peach and lavender hat. I was just enviously coveting said colour combination and wishing my hair/skin tone could wear that! did you use jogless stripes or was it really not necessary? That's a seriously fantastic Felicity!! Love your stripy Felicity! You so can wear purple and orange together it's a striking combination and the whole "look" suits you so well. You be safe on your travels and hope you don't get caught in any traffic woes! The hat is cute! I'm liking slouchy hats more these days, maybe it's the long hair. I'm attempting to teach a boy coworker how to knit. 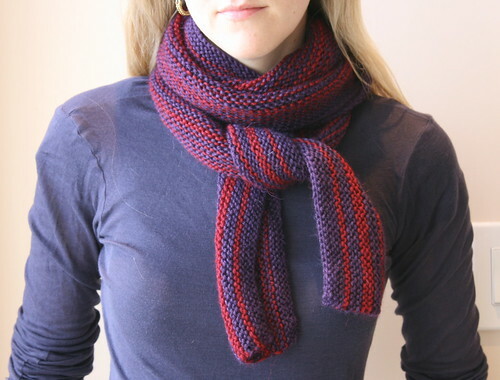 I think the garter stitch scarf might be a good first project. Happy Thanksgiving to you and hope your travels are safe and speedy. Love all the goodies you have made. The little sweater is too precious! 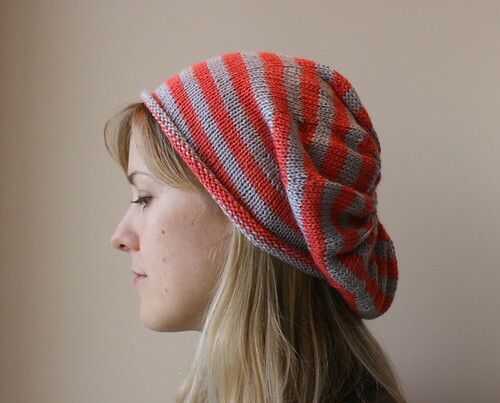 Stripy Felicity - what a great idea!